In many ways pubs are as good a place to discover the history of England as libraries—for hundreds of years they’re where people met and socialised, exchanged gossip and heard the news. Before most people were literate, the few who could read newspapers for the rest. 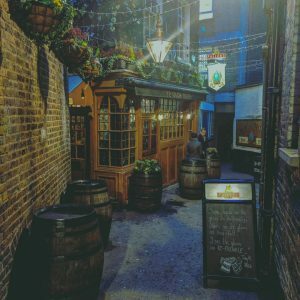 And so, no exploration into London’s past is complete without a pub walk in some of the city’s oldest. Here are the best of the lot around the Chronicle. Opened in 1869, the Viaduct Tavern is the only surviving gin joint in the whole city. The Holborn Viaduct, around the corner from the Old Bailey prison, was the site of many hangings. The pub reflects its dark surroundings—it was one of the most infamous pubs in the area, with brawls breaking out often later in the night. Today, it’s a lovely corner pub that retains its Victorian charm, with its original ceilings and bronzed mirrors. Though you might not find this one straight away. Squeezed away in a back alley just behind Hatton Garden, Ye Old Mitre makes you feel like you’ve stepped through a passageway into the Elizabethan Era. Built in 1546, Queen Elizabeth supposedly danced around a former cherry tree in the garden outside. You can’t do the same, but you can admire the gorgeous Jacobean design of its warm upper floors. 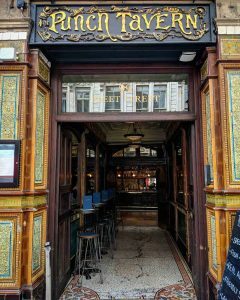 Another former gin palace, the Punch Tavern has seen many incarnations, but its current owners have worked hard to recapture that Victorian feel. Look for the Punch and Judy emblems carved over the door as well as the paintings of Toby the Dog in the tiled mosaic entryway. This 1875 spot is absolutely stunning. From its unique wedge-shaped exterior to the art nouveau interiors, this is a beguiling window into the arts and crafts movement. Take time to examine all the mosaics and reliefs, particularly the monk panels, nestled through the pub. 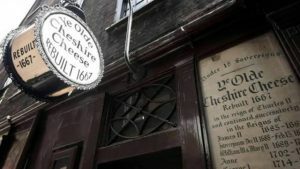 Both the largest and (probably) most evocative pub on this list, Ye Olde Cheshire Cheese is steeped in 17th Century romantic charm. Its high walls and narrow windows give a candlelit moodiness to the rooms that extend up three floors. The basement, now a wine bar, was once part of a monastery nearly a thousand years old. As the centre of the Fleet Street Publishing Industry (link to arch article), it’s also been a centre for many of the literary bigwigs—Samuel Johnson and Charles Dickens numbered this spot among their favourites. This one’s a bit of a cheat—though the pub itself opened in 1994, it’s housed in the former adjunct building to the Law Courts. Its grandiosity is sure to impress—take in the stunning frescoed walls from the mezzanine, where you can people watch all the business types filtering in and out. Finish off with this cosy pub, housed in an interior that’s remarkably one of the few buildings to survive the great fire. Its moody atmosphere should be perfect for the end of your journey, just as it’s getting dark. Keep an eye out for the pub cat, successor to a long line of feline guardians—he goes by the name Ray Brown.